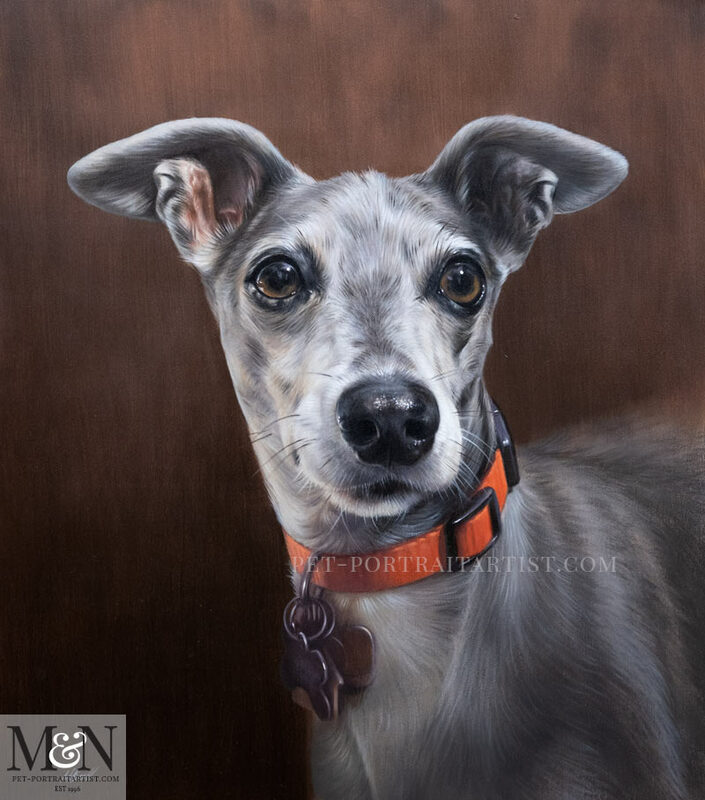 Welcome to our latest dog oil portrait of Spyder. Nicholas traditionally hand painted Spyder for clients Karen and her family in Ohio, USA. 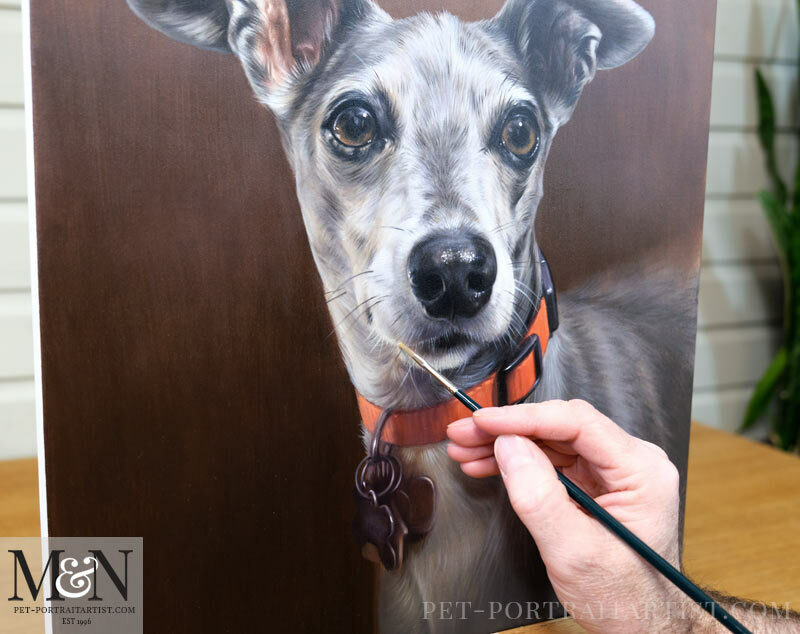 Karen’s husband took some beautiful photos of their dog Spyder specifically for a portrait. Karen initially asked for an 18 x 14 size, however we felt that a bespoke size of 17 x 15 inches size would work best. It seemed to fit well with the composition of Spyder’s photo. All of our canvases are made bespoke by professional canvas makers so we are able to have them made to any size. We always add one of our stickers to the back of them too! We also created a few mockups prior to painting Spyder to show Karen and her husband what Spyder would look like on different tonal backgrounds. This ranged from light, mid and dark tones. We all agreed that a warm mid to dark tone worked the best and I think we were all correct! 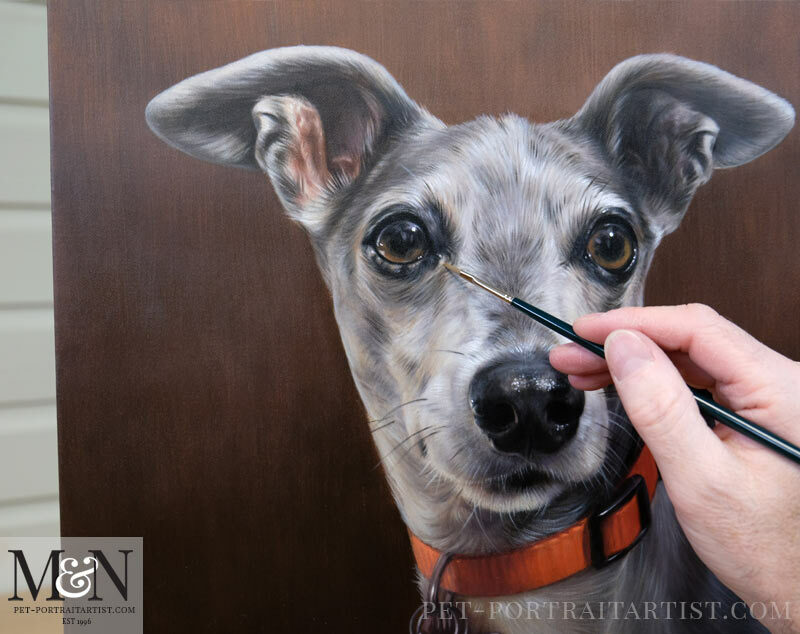 It really helps to bring Spyder into to focus with his beautiful light silvery fur and of course the background is very similar to his eye colouring. Karen emailed below when she saw the final photo of Spyder. 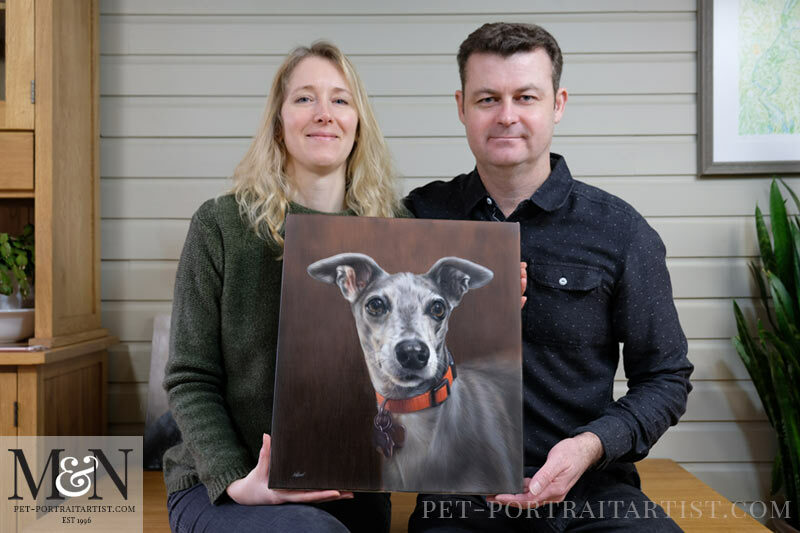 She also requested a photo of us with the portrait which you can see below too! It was taken in our studio, we used the camera timer hence both of us being in the same photo! Melanie and Nicholas – thank you thank you thank you!!! Simply put, it is just beautiful! And thank you for taking the photo with both of you in it. 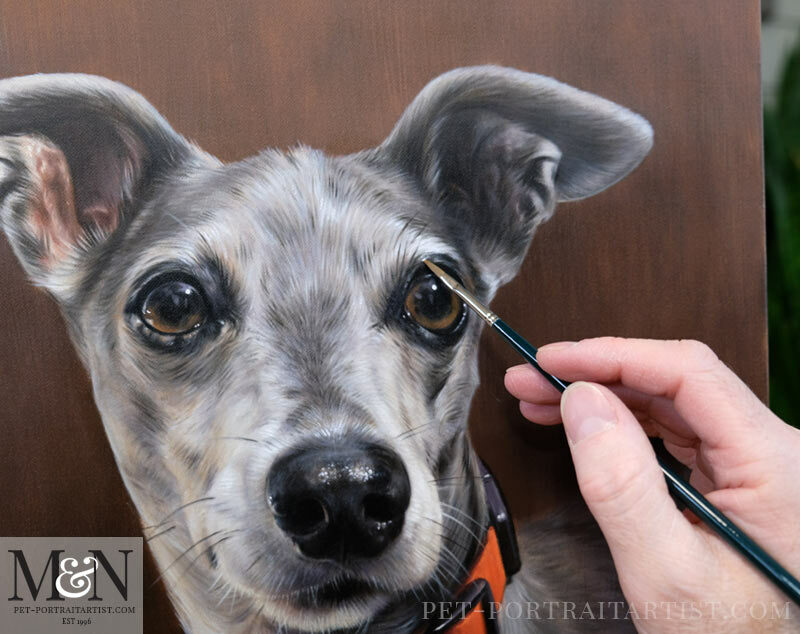 I took some up close photos of Spyder’s portrait in the studio too. You can see Nicholas and his paintbrush in the scene too. We hope you like them! 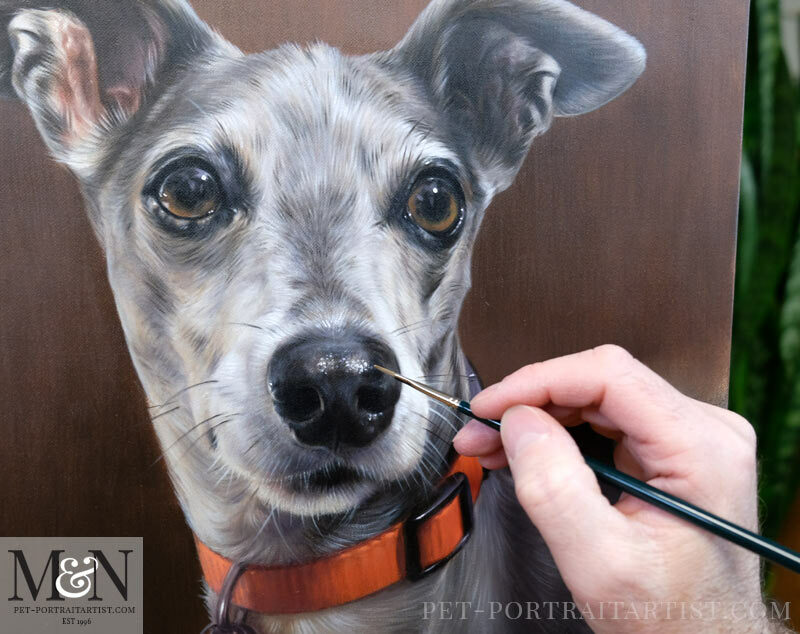 If you would like to commission your own portrait similar to this, why not head to our pet portraits website and contact us from there.